Possibly, like me, you are interested in Tacolneston, the place, because you are an East Anglian of a certain age, and you sat in front of Anglia Television on rainy days during school holidays in the 1970s. Do you remember? The testcard would finish at about nine o'clock, and then we would be tantalised by a diet of the kind of programmes which only Anglia could provide. There was always an Australian children's adventure, which usually involved a clever and exotic tamed animal rescuing children from a river, or capturing a thief. Then there would be a badly dubbed Eastern European fairy tale, over-acted and poorly costumed. There was often a Laurel and Hardy film. I loved it. But before we got all that, we had to sit and watch the Anglia knight revolving on his pedestal to the tune of the hornpipe from Handel's Water Music, and then a voice would announcethat this was Anglia Television for the East of England, coming to you from transmitters at Mendlesham, Tacolneston, Sudbury and Sandy Heath! And so, like all East Anglian children, I knew that Tacolneston was pronounced tackle-st'n, before I ever saw that place-name written down. Well, television programmes are broadcast twenty-four hours a day now, and I don't suppose that Anglia shows the old Eastern European fairy tales anymore. And in any case, I got rid of my television a couple of years back. But, as I cycled into the village, I was pleased to see the great transmitting aerial still standing in a field to the west, like a totem of my childhood. As far as the pleasures that the village of Tacolneston had to offer went, it was all a bit downhill after that. The church is to the north, at a busy bend in the road, a handsome building which is cheerfully overgrown with virginia creeper. Now, I know this is bad for a building, but it always looks good. 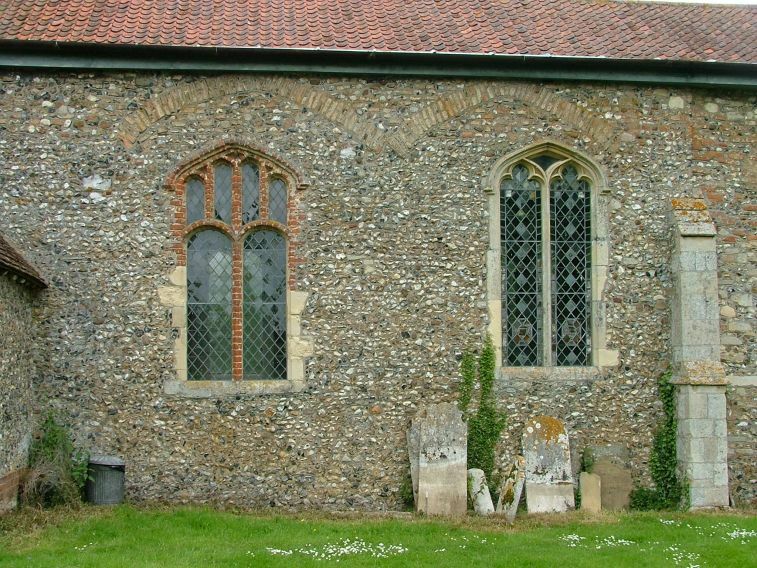 There is an elegant red brick Tudor window in the south side of the nave, and the tower is a fine confection of work from the 14th, 15th and early 16th centuries. I rubbed my hands in anticipation, because I knew that there were similar survivals inside. However, my excitement was dashed at this point, because All Saints is locked without a keyholder. Now, I hadn't expected this. 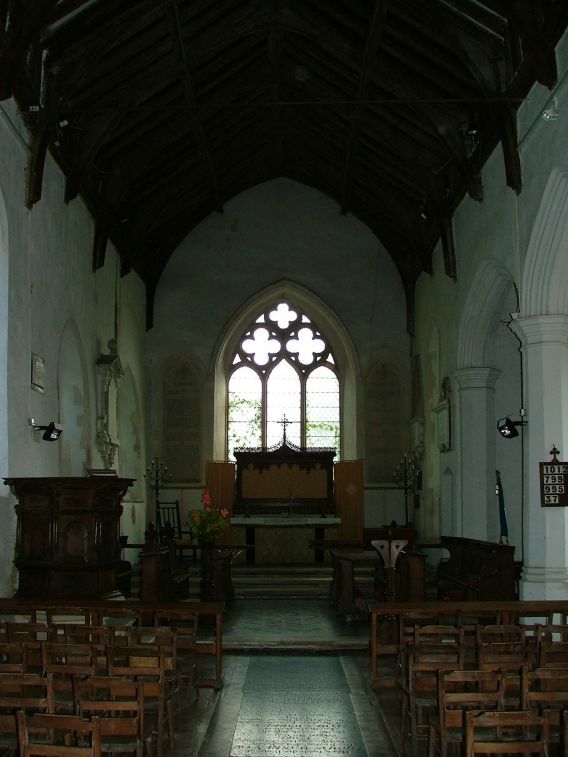 I had headed up from near Diss, and virtually every single church had been open. At Forncett I hit a belt of locked churches with keyholders, but here at Tacolneston even the keyholders petered out. Someone had scrawled across the top of the electoral roll (which was surprisingly brief, considering what a large village this is) Where in God's name is the key to this church? so I knew that I wasn't the first. 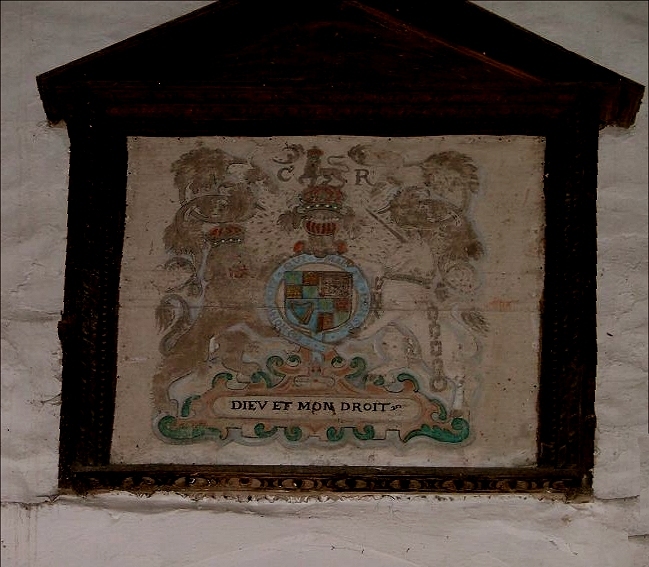 And, since my visit, I have contacted other Norfolk church explorers, and they report the same experience. Tacolneston is exactly the kind of place where the church needs to be open. It is a large village, with lots of young families who need to feel a sense of ownership. It is on a busy road, and frequent indeed must be the strangers and pilgrims who pass this way, and who would appreciate a spot of spiritual refreshment. Now, I am not suggesting that the parish put up a sign that says Come in and rest for a while, although I can think of half a dozen Norfolk churches that do have something like this, but a keyholder would be a start. And there is more than this. 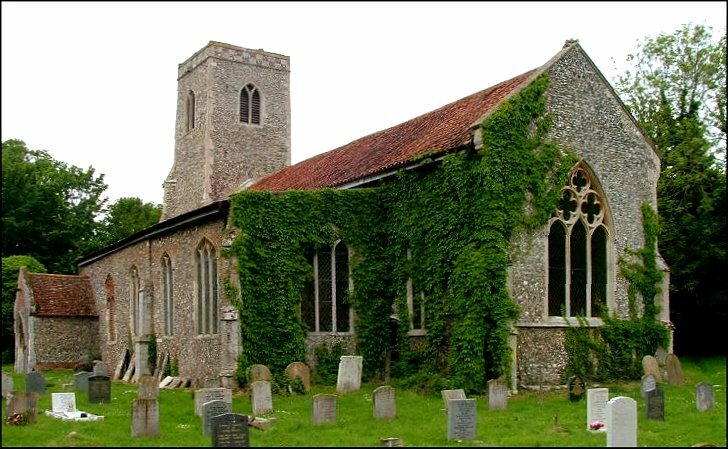 Shortly after my visit, I received an e-mail from a Canadian lady who had made a special trip up to Norwich and then out to Tacolneston to visit the site of her ancestors' baptisms, marriages and burials. She had found the church locked, of course; and she had been so desperate to get in that she had gone along the high street, stopping people and asking them where she might find a key. 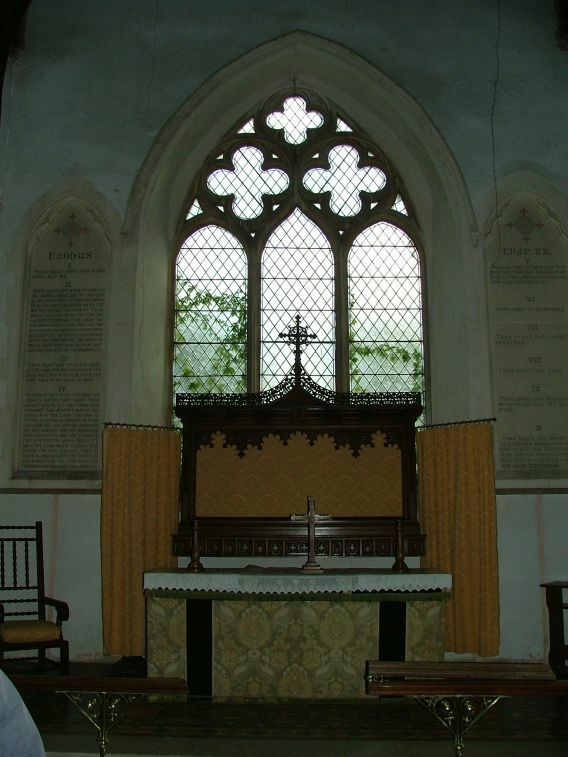 Not a single person could point her in the direction of the Rector or a churchwarden. The poor woman, thousands of miles from home; so near, and yet so very far. Whatever must she think of us? In my opinion, this experience borders on the shameful. I am not an Anglican myself, but there was a time when the Anglican parish church was a visible and spritual presence in every community, and even non-churchgoers felt a sense of ownership. 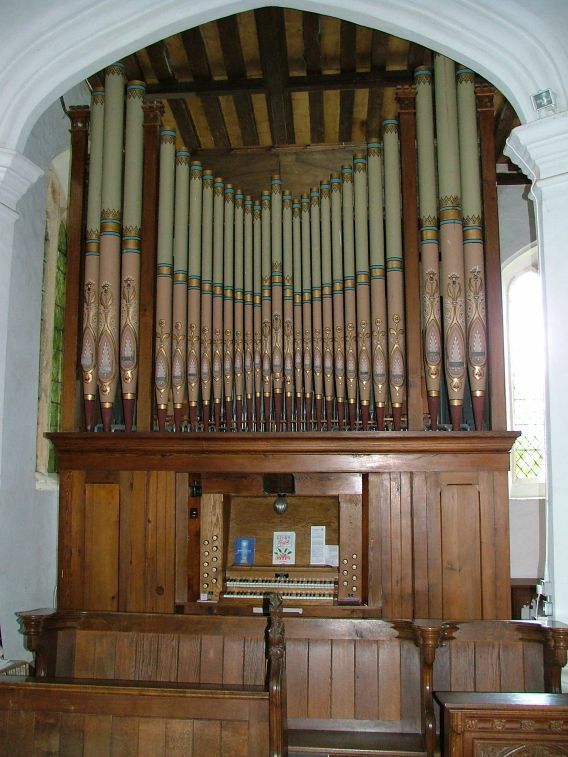 If the Church of England continues its managed decline, and eventually disappears from sight, it will be parishes like Tacolneston which are exactly to blame. Peter and I came back to Tacolneston on the Historic Churches bike ride day in September 2006. This is not a fool-proof method of getting into churches, because parishes that can't be bothered to allow access to their churches on other occasions are very often those that can't be bothered to take part in the bike ride, but All Saints was open, and a couple of yellow t-shirt-clad cyclists were signing in. It was good to see inside. 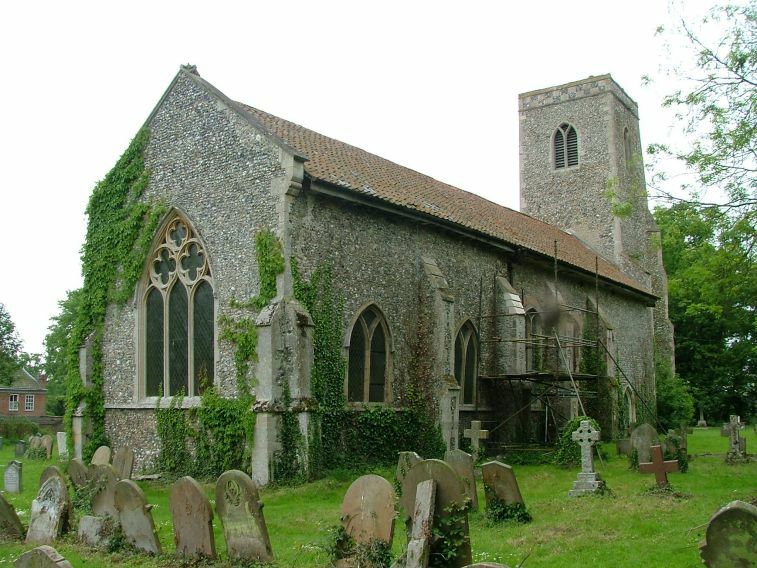 This is by no means Norfolk's most interesting church, but it has a feel of an old, rustic space, probably enhanced by the fact that it is rarely visited. The modern chairs look good, and the bleached arms of Charles I are a treasure. Also a treasure is the surviving dado of the rood screen, which I am afraid is now leaning against the wall of the south aisle, with furniture in front of it and a horrid piece of perspex screwed across the surviving paintings. 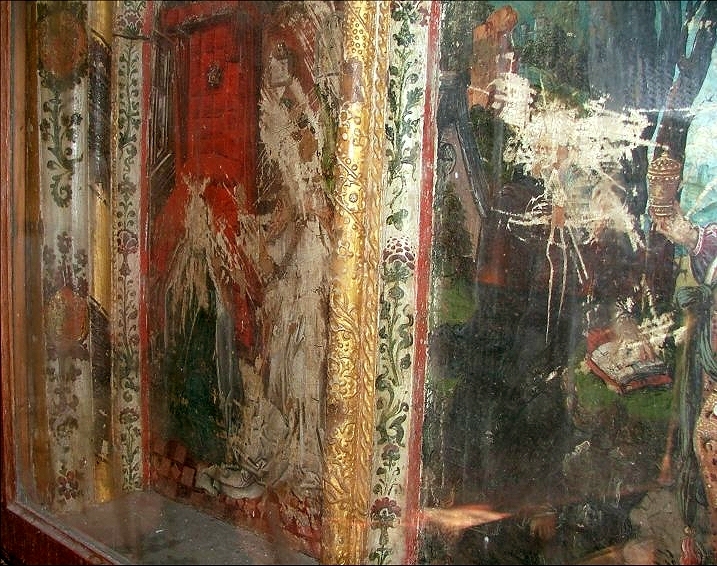 They show the Annunciation and the Temptation of St Anthony, complete scenes in the style of the screens at Loddon and Wellingham, which probably dates it to the 1520s. The scenes are very hard to make out, and almost impossible to photograph. While we were pondering the difficulties of this, the rather stern-faced woman on duty came up and said "I suppose you know that you are very lucky to see inside this church?". I suppose that we did know. I wasn't sure if she was telling us because we didn't seem sufficiently appreciative, or because she felt we were taking advantage. Whatever, when we bid her goodbye a few minutes later, she didn't reply. I came home to discover an e-mail from an Australian friend of this site. 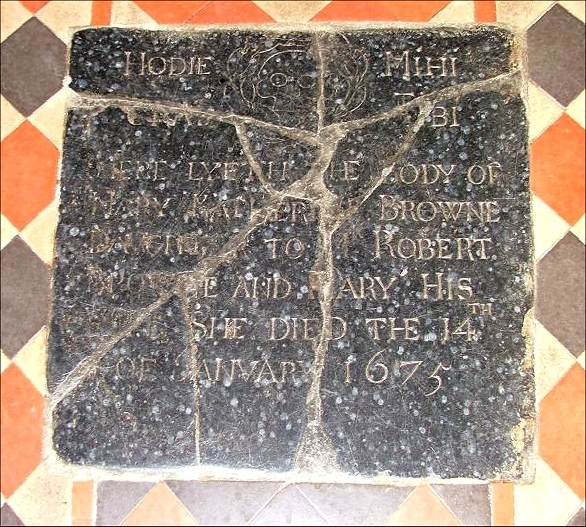 She is in her sixties, had been born in Tacolneston, and had recently been back to Norfolk on a visit. I quote from her e-mail: I was baptised in Tacolneston church, attended Sunday School, joined the church choir, and in 1959 married my husband there and later our two eldest girls were baptised there, so the church holds special memories. Last June we visited my sister in Norfolk, and we visited Bunwell church, where my grandparents are buried and then entered the church. After this, we felt an urge to go in to Tacolneston church perhaps for the last time, who knows. Like you, we were very disappointed to find the church locked. We did not go searching for a key holder, as we thought perhaps a lot of churches found it necessary to be locked, however, from your articles it seems we were wrong. I agree when one has travelled thousands of miles, not to be able to enter is so frustrating and disappointing.